I was able to attend an SIV course at Lake San Antonio this weekend. 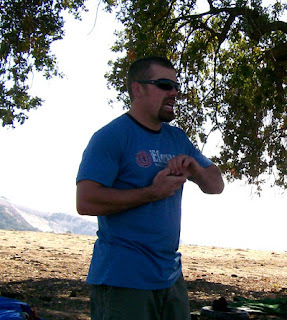 The 3-day class was run by Eagle Paragliding (Rob Sporrer) and featured Brad Gunnicio on the microphone. 1. Go through the collapse series on the Aspen2, emphasis on accelerated collapses. 2. Perform well developed & timed spirals & asymmetric spirals. 3. Learn the entry & recovery of full stalls. 4. Enter & recover from incipient & fully developed spins. I was first in the line-up. Although cloudy, the rain looked like it might stay South of us. Cloudbase looked high enough to get some basic maneuvers in. I suited up in cold wx gear & made ready for the tow. Due to a South wind, we were launching on a tangent to the shore so my time over the beach was longer than the standard pattern (fortunately). Launch went well & soon I was at 100’, just about to cross the beach & fly over the water when Rob came on the mike, “Pin off ! Pin-off! ” I released & turned crosswind to land near our camp. Apparently, one of the drive belts to the hydraulics had slipped & filled the boat with smoke. I’m glad I stayed dry, ‘cause it was maybe 40F. outside. The rain moved in shortly thereafter so we piled into the boat & went to a cabin for lunch & a brief by Brad. The day was over & I had the highest tow of the day ;-) Jim Wells from SLOSA was also at the course. Saturday I was first up again & we towed as high as the cloud overcast would allow. I did the collapses & basic maneuvers (B-line stalls, horseshoe etc.) that Brad asked for. The first tow or two Brad is building trust – I listened & carefully did what Brad said to do WHEN he said to do it. This way he knew that if I did more advanced maneuvers & got balled up, I would still comply with his instructions. We all got to do the basics & 90 minutes later it was my turn again. Launch went well & I was soon 2000’ above the lake & upwind of the camp a mile or so. Suddenly the tension on the line went away & I realized that I was not attached to the boat any more. First order of business, steer the jet. I headed towards the camp & glide looked good. Next, I pulled in the line until the drogue chute was in my lap & pinned it under my leg. I could now see the line all the way to the water & realized that the lower I got, the more drag the line would have. I was just digesting this info when Brad said to do what I was working towards, “Disconnect the tow hitch in case the line snags on anything.” Good call, Brad. Then I planned my flight path so I didn’t overfly any trees or boats & flew downwind of the camp, dumped the drogue from about 150’ above the beach & landed back in front of the launch. Kind of a fun exercise! A splice had let loose & soon the boys had it repaired & we were back in business. I got the next tow (since I hadn’t done any maneuvers) and was soon spiraling and collapsing again. It was great to be able to screw the wing up & get it back into shape without any concern of impact with the ground. Brad was great at encouraging & coaching. He kept it up all day long without losing his sense of humor or attention. I drove home Sat. night with a sense of excitement – Tomorrow I get to do full stalls & SATs. At this point we had a couple of mechanical issues that really slowed the day down. Rob & the crew did their best to get things going again. After 90 minutes we resumed towing. My first tow was very high & allowed me to do 5 full stalls. I was anticipating a much more dynamic reaction from the wing. The entry & recovery were both benign compared to my expectations. On my last flight we were able to do 4 SAT entries & a few spirals. The SAT entry was not very hard technically, but was harder to do physically than I expected. The pull to initiate the maneuver required a wrap and I found the pull on the brake line to be more tension around my hand than I liked – in fact, I still have a numb pinky. The successive SATs really scrambled my brains. After rolling out of the last SAT, Brad wanted me to enter a spiral. I was so dizzy that I just ignored him for a few seconds to get my bearings & breath back. When he says on the video, "you're probably dizzy as hell. . ." he was so right. Then I entered some of my best & most dynamic asymmetric spirals. I was able to get way over the wing & felt the timing when it was working. The Aspen 2 really has a lot of energy & SATs very well too. Brad’s debriefs were very helpful & I’m sure that as I rerun the maneuvers in my head, I’ll learn much more. I’m looking forward to working with Rob Sporrer & Brad again. My wife Mary also had an ‘active’ weekend while I was at the lake. She ran the City to the Sea Half Marathon & set a personal best of 1:55. She placed 6th in her age bracket! Jack G., Dave S. & I headed to Bishop to fly in the Owens Valley with the BAPA XC league. We had high hope for good weather & long flights. On the Friday eve drive North on 395 we saw the weather at left over the southern White Mountains (the East side of the Owens valley.) (click on pic) We saw some beautiful cloud build-ups & the Sierras were dusted that night with snow. This proved to be the last of the weather though. Saturday dawned clear & beautiful. Unfortunately the winds were higher on Sat. than was prudent to fly, so we all had a recreational day in/around Bishop. Sat. night we all met at a pizza parlor to tell stories & celebrate Kari Castle's birthday. Sunday looked good on paper, but had a very stable lapse rate, so lift was forcast to be weak & tops of lift - low. A task was called which ran us upvalley to Casbah & then South to Pupfish & across the valley to Keogh. The leg North was straight-forward but lift petered out below 9000'. The field of 45 was littered all along the course. It was not a day to race - it was one of survival. I was able to hang with Jug & Rob S., thermaling towards Casbah. The guys decided to head out in the valley & tag the point & come back . I decided to hang back & work the last of the weak thermal. After gaining another 400' I too headed for Casbah. A mile from the turnpoint I found a great little core which bought me another 800'. I then tagged the turnpoint & returned to the foothills and entered the thermal the boys had found - this time I was on the top of the stack. This allowed me to work up high enough to make it down range & limp a mile of so farther than the field. Jug & maybe Josh C. were the only guys who made it further South than I. I put down in scrub near Susan who was headed to the waypoint. The scrub consisted of what seemed like barbed-wire tumbleweeds & it took 15 minutes to clear & fold the wing and another 50 minutes to cover the three mile hike to Hwy 6. A few pilots launched 30 minutes before the start & flushed to the LZ in spite of some gallant struggles. A couple of good pilots hung in there & eventually I launched about 5 minutes after the Start Cylinder opened. There was speculation on the hill, earlier, that it may be the kind of day where you may be lucky to exceed minimum distance (5 miles) but after launch I climbed well to 8300' & Dave was ahead of me with good altitude. It looked like the day was improving. Since climbs were low, I headed out lower than I wanted to. 15 minutes later I was only 600' off the deck & looking at another long hike to the road. . . I needed some lift NOW. With only 4 minutes to landing left, I felt a burble that foretold a core nearby. Soon I was happily climbing back into the game. I hate getting low when competing - it just slows you down drastically - but a save from low altitude is quite rewarding & set the tone for the next 18 miles. I soon found myself flying with Bill Belcourt & Montana (both of whom made goal, dangit). We climbed in a couple of serpentine thermals to around 8000' but they wanted to push deep into the high ground. I knew the potential for high climbs was greater over the high ground, but I was sporting a serious blister from yesterday & didn't want to hike more than a couple of miles. They were also on higher performance wings, so I played it safe & stayed over the fingers. This worked for awhile, but eventually I needed to point at the goal, use the tailwind, & head into the flats. I was able to find a couple of small thermals in the valley but not enough to make goal. I eventually landed 3/4 of a mile from Hwy 6 and 6 miles short of goal. 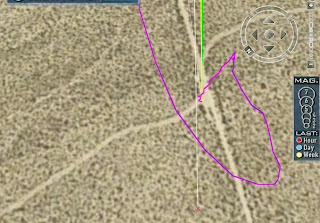 This time I found a nice spot with an intersection of two dirt roads that allowed me to land and lay the wing down, clear of any scrub. The landing went just as planned & the wing came down with nary a snag. Meanwhile Dave had his best day & landed a mere 1/4 mile from goal. Altogether Dave & I drove 12 hours & each flew about 3.5 hours. . . This is within my personal 4:1 acceptable ratio of drive/fly. To be able to fly 2 out of 3 days in the Owens is great. Jack was very generous to offer us the use of his Tahoe to shuttle pilots up the hill. Dave was a great flying partner - able to candidly debrief with meaningful insights. The breadth of experience in this weekend's competitor list was unprecedented in BAPA comps. We had 5 US National Champs (including 3 of this year's US World's Team members) & many more top 20 pilots competing. What a great learning experience. Jug has done a great job of building this league to a regional status. His attention to detail & professionalism has made us all better pilots.